This simply sweet Easter table runner is created with just three quilt blocks, bordered by bunnies on parade while using the Baby Lock Destiny II for quilting. 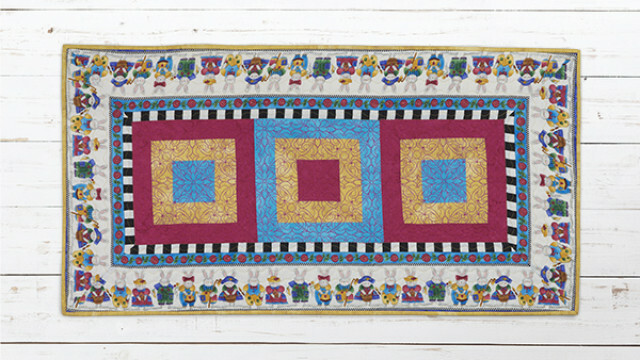 This quilted piece is sure to bring a bit of spring to your dining room table! Download printable instructions. Press the seams toward the yellow strips. The strip-sets should measure 5 inches across when completed. Using the Companion Angle Ruler, cut the strip-sets into triangles. Align the tip of the ruler with the top of a strip-set. Match the edges of two triangles with blue tips; pin the seam to keep the strips from shifting. Begin stitching at the center of the seam and stitch to the outside edge. Stitch the remainder of the seam from the center outward as well. Remove the pins and press. Stitch all of the triangles together and press. 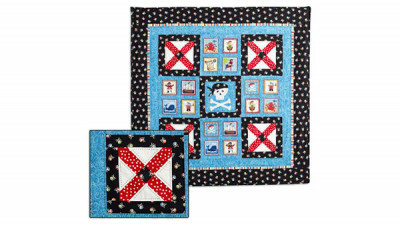 Using the same method of matching the edges and pinning, prepare the triangles to be stitched into three blocks: two with blue centers and one with a pink center. Stitch from the center outward for each block. Press well. Take a moment and square-up the edges of the blocks. Stitch the three blocks together, alternating the color combinations. Press the seams. Prepare to add the border strips by locating and marking the centers of each border strip. Stitch the 52” border strips to either side of the table runner blocks, matching the center of the strips to the center of the blocks. Start and stop stitching ¼-inch from each end. Press the seams toward the border strips. There will be approximately 6 to 7 inches extra of the border strip, on both ends. Stitch the 34-inch border strips to each of the remaining sides of the table runner. Start and stop stitching ¼-inch from each end. Press the seams toward the border strips. 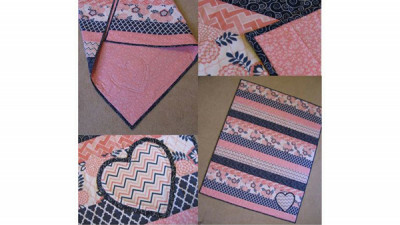 Working with one corner at a time, fold both the border strips and the table runner in half diagonally with right sides facing, creating a triangle. Line up the border strips carefully. When the borders are aligned, place a ruler along the border strips and onto the table runner. Mark this angle with a water-soluble marker. 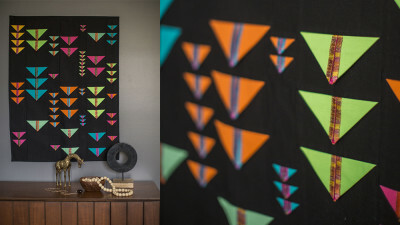 Pin the borders together and move to the sewing machine. Stitch along the marked line from the seam to the outer edge of the borders. Unfold the table runner and make sure there are no gaps at the inner corner and that the border lies flat. Press the border and trim the excess to a ¼-inch seam. Repeat this process for the remaining three corners. The backing fabric requirement is for the table runner being laid selvage to selvage, not lengthwise along the selvage. Layer the table runner top, batting and backing. Baste the layers together. Quilt as desired, either by machine or hand. Here, the three center blocks were quilted using the large pattern fills in IQ Designer from the Destiny II. In the IQ Designer draw a square the same size as the measurement of the block. 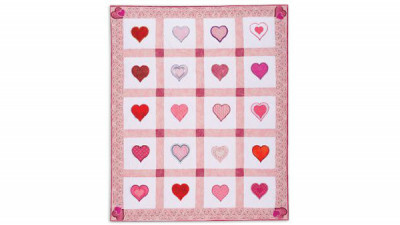 Select the pattern fill of your choice and fill the inside of the square. Save the design and send to the embroidery field. Hoop the quilt sandwich so that the first square in centered in the largest hoop. Use the Camera to scan the hoop.
. Center the design over the quilt sandwich square. Repeat for the two remaining squares. Make a label and stitch it to the back of the table runner.